“We take great pride in our high level of professionalism, timeliness and attentive customer service,” Chris says, “We make every effort to develop lasting, personal relationships, so that our customers always know who to call.” “We treat your lawn like it’s our own,” adds Ginnie. Chris is an Animal Science graduate from North Dakota State University, and spent much of his previous career in sales and marketing. Ginnie is an Animal Science graduate from Penn State University, where she also earned an MBA in Marketing. She also serves SE Indiana as a Small Business Development Advisor. She has an additional Master’s degree from South Dakota State University. At Loving Hearts Hospice and Palliative Care, we believe quality of life as important as length of life and helping our patients and their family members is an essential part of our business. At Loving Hearts, we want to help you every step of along the way through comfort, dignity and personal support. We have created a hospice care experience we believe is beyond compare. Our care is compassionate, unique and innovative. Loving Hearts care embraces your physical, emotional and spiritual needs – as well as the needs of your family, friends and caregivers. If a primary physician recommends hospice or palliative care for you or a loved one – YOU as a patient or FAMILY MEMBER can choose which agency you want. BE SPECIFIC – and request LOVING HEARTS. LOVING HEARTS is available to anyone in Dearborn, Franklin, Ohio and Ripley counties. The earlier YOU begin receiving hospice or palliative care – the more HELP and SUPPORT we can offer. LOVING HEARTS has a compassionate team to help YOU receive the care you need. Hospice and Palliative care services are covered 100% by insurance. COMFORT WHEN YOU NEED HELP! Hospice or Palliative care is an option for anyone with a life-limiting illness. Hospice or Palliative Care can bring QUALITY OF LIFE at a very difficult time. Wherever you are in your health care journey – LOVING HEARTS is here to HELP. Loving Hearts is locally owned and operated allowing us to make decisions on a patient-to-patient basis, providing only top quality hospice care. Hidden Valley Lake resident 30 years. Fully insured with Worker’s Comp. and $1 million liability policy. We are currently servicing over 100 yards In Hidden Valley for lawn care. 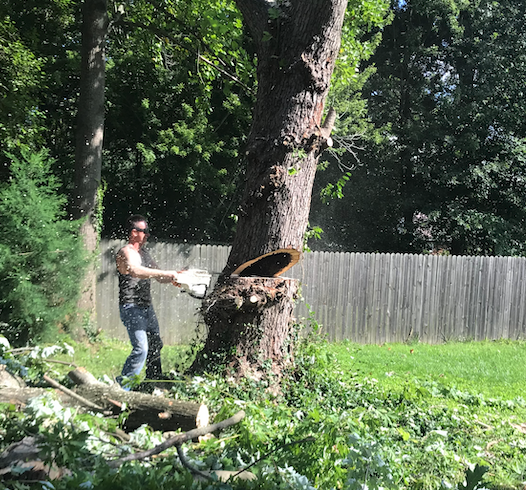 We offer expert tree removal and excavation. Nature Nook® is a Cincinnati area florist and wine shop providing flower and wine delivery throughout Cincinnati, OH. Located on the west side of Cincinnati in Cleves, OH we are convenient for daily flower delivery to throughout Cincinnati, OH, Cleves, OH, North Bend, OH, Harrison, OH, Lawrenceburg, IN and Northern Kentucky. We create beautiful flower arrangements for every day occasions, funerals, and holidays such as Valentine’s Day, Mother’s Day, Easter, Thanksgiving and Christmas. Nature Nook is also an exceptional wedding and event florist offering high quality flowers and designs to fit any budget. Visit our wedding flower website to see our work and learn how to schedule your free consultion: naturenookweddings.com. Stop in for one of our wine tastings and browse our wine selection which includes a large variety of fine wines from small production wineries around the world. Stop in our store to browse our wines, or order a fine wine to send with flowers, in a gourmet basket or individually from our website. You’ll find unique wines that aren’t available in large retail chains. Fine wines, chocolates and gourmet food baskets make wonderful gifts. We also offer case discounts on wines for weddings and events. Premier Properties is a privately held, locally owned real estate firm owned by Dave and Kathy Patterson. Our office is located at 1230 Belleview Drive, conveniently located on Route 1 between US50 & Ridge Avenue in Greendale, one half block from I-275, Lawrenceburg exit! We are assisted by our agents, Paige Wurtz, Sarah Givin, Mike Chaney, and Sherry Gabbard, and by our very able Administrative Assistant Donna Ortiz. We only work in Indiana and specialize in Southeastern Indiana. We list market and sell residential properties, vacant land, farms and commercial properties. Our target market area is Hidden Valley, Valley Woods, Bright, Greendale, and Lawrenceburg, but we also serve the half a dozen surrounding counties. Dave and Kathy have lived in Hidden Valley since 1994 and are very familiar with HVL and its surroundings. Dave has been very active in Hidden Valley, especially with the Lakes Committee, which he has chaired since about 1997. Kathy has been active with the Dearborn County Home Builders Association where she is a board member, and also the Dearborn County Chamber of Commerce where she is a past president and a current board member. Whether you’re buying or selling, you can count on us for Premier Properties, Premier Production, and Premier Service. Providing tree removal to Hidden Valley Lake residents including cutting tree down, removal, and brush clean up. 25 years of experience and fully insured. Free estimates. Give us a call at 513-237-9594. Richard Bacovin Jewelers & Mfg. Inc. Selection of Diamonds, In House Custom Designs, Repairs and Restoration of Fine Jewelry. We take pride in personalized attention to all your Jewelry needs, specializing in Diamonds and Gemstones…Bridal & Anniversary Designs, as well as restoration of your family heirlooms, all tailored to your specific wishes. See our Award Winning Designs! We invite you to stop in for a complimentary inspection & cleaning of your fine jewelry. “If We Don’t Have, We’ll Make It”! Visit our Showroom with Factory on the Premises in Harrison, Ohio. Darryl and Ashley Howe, owners and brokers of Star One Realtors, are long term Hidden Valley Lake residents. Ashley has been one of the leading real estate agents for Hidden Valley Lake for the past 25 years. She knows the community inside and out and will go above and beyond for your real estate needs. The Star One office is conveniently located across from the front gate. HVL resident. 30 + years experience. Decks,docks,finished basements,kitchens,and baths. Free estimates. Call Now! WE are driven and devoted to make all clients feel as they have received the highest level of service possible! You will be pleased with the personal attention and promptness WE PROMISE you! WE work with sellers and buyers in ALL price ranges! WE also love helping families find their first or next home and assist with Investors finding their next project. Our team has several years experience in New Construction Sales, so if building a home is on your ‘To Do List’, we can help guide you every step of the way. We are pleased to have a Commercial Realtor on our team, with plenty of years experience under his belt – he has sold over 400 properties. We are waiting to be your Outstanding Team of Realtors! As Keller Williams Associates, we are proud to work for a company that is #1 in the number of US Employees and #1 in Company Training in the US! This company is dedicated to community service at our Annual Red Day. Keller Williams was also listed as #3 Happiest Places To Work in 2016 by Forbes! Our marketing plan uses a different technique which includes a full time marketing manager who uses blogging, videos and social media to give our listing’s the most exposure. We take pride in what we do and it shows! We recently won the 30 in 30 Chamber Award for one of the fastest growing businesses in the area. One of the reasons for our growth spurt, was the addition of our call center! Allow us to help make this experience exactly as it should be, a wonderful journey in your path of life. Our team is licensed in OH/KY/IN! Tremain’s Lawn & Landscape is a Lawrenceburg, IN based outdoor services company servicing the Southeastern IN and Southwestern OH areas. Focusing on dependable and consistent service at affordable prices Tremain’s has doubled in size each of its first three years in business. With over 20 years of Green Industry experience, you will be in good hands with Tremain’s. We offer weekly and bi-weekly lawn care service, Landscape Maintenance including Spring/Fall Cleanups and Fall Leaf Cleanups, Landscape Installs including Plant Removals/Installs and computer-aided design, and Lawn Maintenance programs including Fertilize programs, Weed Control programs, and Lawn Aeration/Overseeding. Check out our website at TremainsLawn.com, or call us today for a Free Estimate at 812-584-0670. Most lawn care and turf programs can be estimated within minutes! Trinity Dry Cleaners is a family owned business located in Lawrenceburg, IN and services customers in IN, OH, and KY. Our mission is to provide exceptional cleaning results while utilizing environmentally responsible resources. We provide a free pick up and delivery service to the Hidden Valley Community every Monday and Thursday to customers that regularly require dry cleaning and laundry services. We also provide full visibility to your orders and allow you to schedule pick-ups through our cellphone app. Our drivers are mature, have passed extensive background checks and are bonded and insured. Call us today to sign up for our free delivery service. Trinity Dry Cleaners is dedicated to making a difference, for the Tri-State area. It all starts with our unique GreenEarth dry cleaning process. It is safer for people and the environment because it uses no hazardous chemicals and is non-polluting and non-toxic. Our eco friendly technology is one of the many ways we try to be a green dry cleaner. We pride ourselves on our superior customer service skills and outstanding quality. We also provide a complete tailoring and alterations service and clean a wide variety of household items and leather goods as well as offering a shoe repair service. Whether you are considering buying a home or selling a home, our Team can assist you and is ready to serve you in the Tri-state area of Southeastern Indiana, Kentucky or Ohio. Visit our website for more information and utilize our website as a resource to search for properties in all three states and to obtain neighborhood or school information. Contact us today at (859) 743-1360 or email Kimberly@TristatePartners.com.